Create a planning by adding activities. In the Planning page, in the Edit group, click New Activity. Create your planning faster by adding new activities by using the Copy and Paste feature in the Edit group. In the Description field enter some important information on the activity, e.g. the targeted deliverables or internal remarks. InLoox PM provides you with a range of formatting features. For the detailed description, see Create and change comments in the Customize comments section. Define its duration and dependencies regarding other planning elements. In the Duration box, enter the duration in days and enter the hours in the box on the right side. The constraint As soon as possible is set up as default value for the Start and As late as possible for the End. InLoox PM will automatically display the calculated date in the Time frame section. Define the progress or activate the done check box to display the processing status of the activity. In the Location field, enter a location. 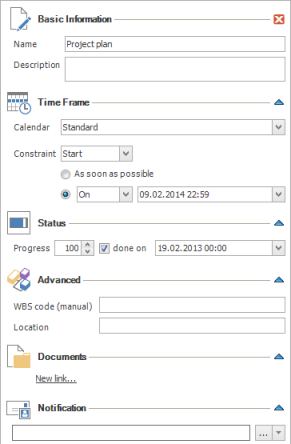 In the WBS code box, enter a work breakdown structure code to identify activities and milestones in large projects. In this case you can define the subsumption. You can use the field with the automatic WBS code in the project list. Click New link... to add the document. In the Select Entry dialog box select one document from the list and click OK.
All displayed documents in the dialog box are saved on the Documents page. For more information on how to add the document to the project, see Create and edit a document. The added document ist displayed in the Document area on the side panel. Click it to open this document. Click Delete symbol to remove it. All added resources receive automatically notifications about new, edit or deleted activities. In the area Notifications, you can inform other resources,e.g. project planner, about assigned work packages and about the changes in them. Click the command to add resources. In the Select Contact dialog box click on the name and then click Select and OK. The notification will be send on the selected resource as an email, when you save and close the project. For more information on how to edit the notification type, see Customize a notification template. Add Outlook tasks and appointments to the InLoox PM Planning via Drag and Drop. The duration of this new activity is an actual effort drawn from the Outlook task or the duration of the Outlook appointment. Select the last planning item in the planning and click ↓ on your keyboard to create a new planning item. How to add and edit a planned activity | InLoox PM 8 • Copyright 1999-2019 © InLoox GmbH. Tous droits réservés.